You probably know that smoking and excessive drinking are bad for you. But did you know that your genetics also factor into how much those vices can impact your health? Healthy lifestyle choice – like avoiding cigarettes – make you less susceptible to a host to diseases. For instance, non-smokers live, on average, a decade longer than smokers. Genetics aside it just makes a lot of sense to avoid lighting up. But genetics also plays a role. Your genes – regardless of your health habits – may put you at higher risk for certain diseases associated with smoking and drinking. That can make the healthy choices you make that much more important. Your genetic information, when taken together with information about your lifestyle and environment, will give you the most complete picture of your health risks. But, in a few cases, your genetics can increase the risks of smoking and drinking by much more than either risk factor alone. Heightening the importance of making healthy choices. Here are a few examples. A variant in a single gene, alpha-1 antitrypsin, leads to deficiency in a protein that protects fragile lung tissue. This can put one at more risk for emphysema and liver disease. Because smoking can further reduce the levels of the protective protein, it can further increase the risks for lung disease. Another variant in the ALDH2 gene causes a deficiency in its enzyme product – aldehyde dehydrogenase. 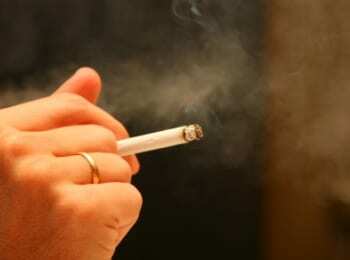 Those lacking this enzyme are at increased risk for esophageal cancer, especially for those who smoke or drink. The magnitude of the combined effect varies from study to study, but the basic finding that these three risk factors synergistically increase the risk of esophageal cancer is definitive. In the case of smoking, a variant in the CHRNA gene is strongly associated with how many times you light up in an average day. In people with European ancestry, each copy of an A at the single-nucleotide polymorphism (SNP) rs1051730 is associated with smoking one more cigarette per day on average. It’s unclear if the association also holds true for people of African or Asian ancestry. As for drinking, a number of previous studies found an association between the SNP rs1800497 and alcoholism, with each copy of A at that location increasing a person’s odds of being alcoholic by 1.2 times. Keep in mind that there are many of other conditions associated with smoking and drinking that are also impacted by your genetics. For instance, if you light up regularly, you’re putting yourself at a higher risk for such things as lung cancer, esophageal cancer, age-related macular degeneration, multiple sclerosis, psoriasis, rheumatoid arthritis, venous thrombosis and coronary heart disease. esophageal cancer, colorectal cancer and atrial fibrillation.